Holy Saturday, the day before Easter, is the quietest day of the year in the Church. Today, we remember Jesus being in the tomb. We remember the grief of His Apostles, who abandoned Him at His darkest hour. 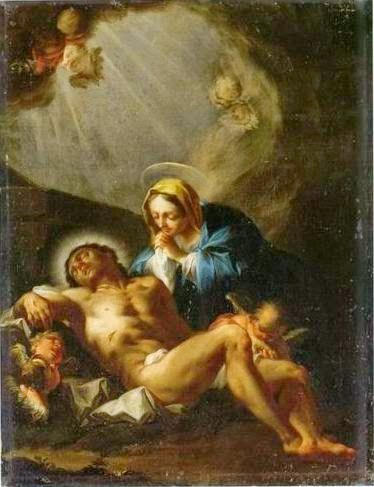 We remember the tears of His mother, Mary, who suffered the emotional and spiritual pain of watching her innocent Son tortured and crucified for the sins of others. Some people believe she waited by Jesus’ tomb until His resurrection, knowing in faith that God would conquer death. There is no Mass until after sundown, when Easter begins with the glorious Vigil Mass. At Vigil Mass, the new fire is kindled, the new Paschal candle is lit that will burn at every Mass till next year, and tens of thousands of new Catholics will be received into the Church all over the world. Today is the day of preparation for Easter. There isn’t anything to celebrate yet, but we can prepare for it by putting together little gifts for family and friends or making various dishes for our Easter feasts. (Here is a recipe for “Empty Tomb Rolls” using refrigerated dough that you may want to try.) Dying Easter eggs is a popular custom that stems from a tradition about Mary Magdalene in the Orthodox Church: They say that Tiberius Caesar scoffed at the idea of Jesus’ resurrection over dinner, telling Mary Magdalene, “A man cannot rise from the dead any more than the egg in your hand will turn red.” Of course, it immediately turned red! Jesus Christ, have mercy on me, a sinner!